This article describes how to integrate Drupal 7 in Enterprise to make it possible to publish from Enterprise to a Web environment based on Drupal 7. Chaos tools suite (ctools). Download this from the Drupal Web site. OAuth. Download this from the Drupal Web site. WoodWing Enterprise. Download the file named Enterprise Drupal 7 Integration from the software download page. Step 2b. Unzip the downloaded files. Note: If the directory is not available yet, create the directory. Step 2d. Enable the installed modules. Note: The Drupal 7 Enterprise module will appear as "WoodWing Enterprise"
Step 3. Create a content type in Drupal for each type of Drupal post and add the required fields. Note: Restrictions exist for the types of fields and their properties that can be imported by Enterprise. For more information, see Supported Drupal fields for use in Publish Form templates in Enterprise 9. OAuth provides a secure connection between Enterprise Server and Drupal. Step 4a. Log in to Drupal as administrator. Step 4b. Navigate to Configuration > Web Services > OAuth. Step 4c. Click Add Context. Signature Methods: only select "HMAC-SHA256"
Using OAuth requires setting up a Consumer Key and a Consumer Secret. Step 5a. In the top menu bar, click People. Step 5b. Click Edit for the user account that is going to be used for publishing content. Note: To create previews from Content Station the user must have an administrator role. Step 5c. Click OAuth Consumers > Add Consumer. Step 5f. Navigate back to OAuth Consumers. Step 5g. Click Edit for the WoodWing Enterprise consumer. The Drupal functionality in Enterprise needs to be enabled by enabling the "Drupal 7 - Publish Forms" Server plug-in. Step 6a. Log in to Enterprise Server. Step 6b. Click Server Plug-ins in the Maintenance menu or on the Home page. The Server Plug-ins page appears. Step 6c. Enable the plug-in named Drupal 7 - Publish Forms by clicking the Unplugged icon . It changes to a Plugged In icon . Publishing to your Drupal 7 Web site from Enterprise is done through a Publication Channel. Step 7a. In the Name field, enter a name. Step 7b. In the Description field, enter a description. Step 7c. From the Publication Channel Type	list, choose Web. Step 7d. 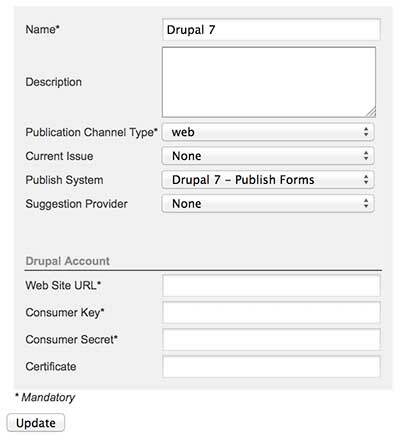 From the Publish System	list, choose Drupal 7 — Publish Forms. Step 7e. (Optional, only when tags should be automatically suggested. See About adding tags to Web articles). From the Suggestion Provider list, choose the provider for suggesting tags. Step 7f. Click Create. The Drupal Account options appear. Consumer Key: The consumer key as generated on Drupal in step 5. Consumer Secret: The consumer secret as generated on Drupal in step 5. Step 7i. Create an Issue by clicking the Add Issue button and subsequently entering at least a name for the Issue. Step 8a. Log in to Enterprise Server. Step 8b. In the Maintenance menu, click Advanced. A page showing links to advanced Enterprise options appears. Step 8c. Click Health Check. The Health Check page appears. Step 8d. Run the Publish to Drupal - Publish Forms test. The test result is displayed. Step 8e. (Optional, only if the test failed). Follow the instructions and run the test once more after making any changes to the Drupal configuration. Repeat this process until the test is performed successfully. Click Drupal 7. 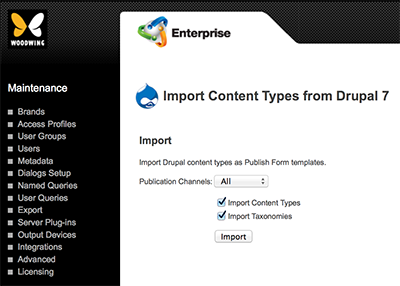 The "Import Content Types from Drupal" Maintenance page appears. Step 9c. Make sure that the check boxes for importing content types and taxonomies are both selected (only available in Enterprise Server 9.3 or higher).